Patreon announced earlier this month that it will change its transaction fee structure. 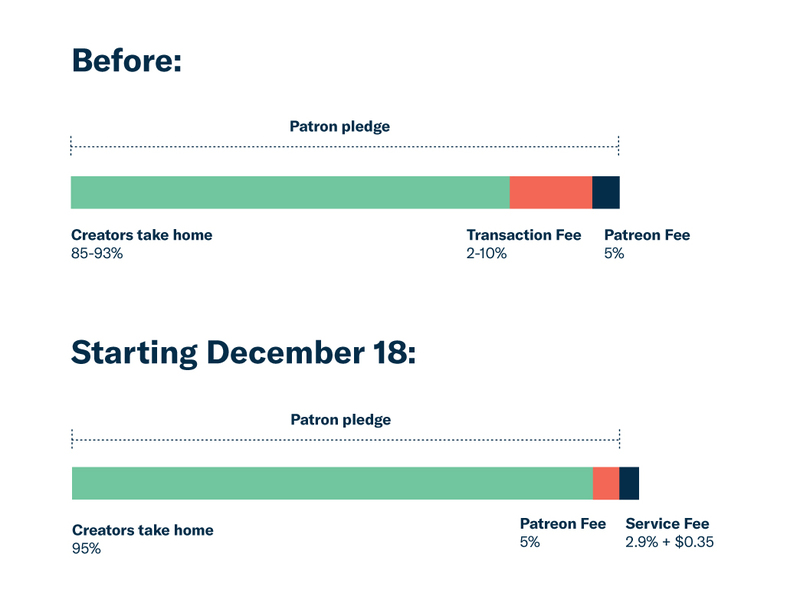 As far as I can tell, the upshot is that Patreon (1) will no longer bundle the credit card charges of patrons who pledge to multiple accounts and (2) will now tack payment processing fees on top of pledges rather than taking them out of pledges. Most of the reactions to the change seem to be focused on number (2), i.e. the fact that processing fees will be tacked on to pledges rather than taken out of pledges. But the real action here is not the tacking-on. It is the debundling, as explained in Patreon’s deep dive on the change. Under the old system, if a patron pledged $1 to 10 different creators, they would generally be charged $10 one time at the beginning of each month. Now, as far as I can tell, they will be charged $1 ten separate times. 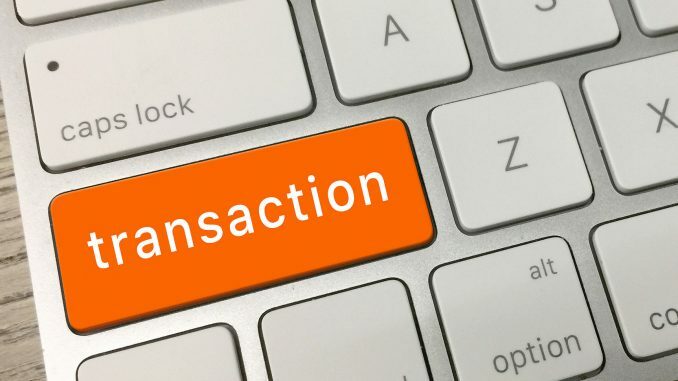 Since processing 10 one-dollar payments is much more expensive than processing 1 ten-dollar payment, this change will cause overall processing fees to go up. The new tacked-on service fee is an attempt to distribute these new processing costs on to patrons rather than creators. Having read Patreon’s explanation for this change, I must admit I am a bit baffled by it. They make a good case that bundling charges creates a high level of complexity and a variety of edge-case snags that irritate creators and patrons alike. But to my mind, handling this complexity and weathering these snags in order to keep the transaction costs down is Patreon’s great value-add. By bringing a bunch of creators to the same platform and bundling their mutual supporters’ payments, Patreon allows for microtransactions that processing costs would otherwise make unfeasible. Under the new regime, this will no longer be true. To get a sense of how much processing costs are going up, here is an example using 3P’s data. In the first column, we have the actual data from our last month of activity. 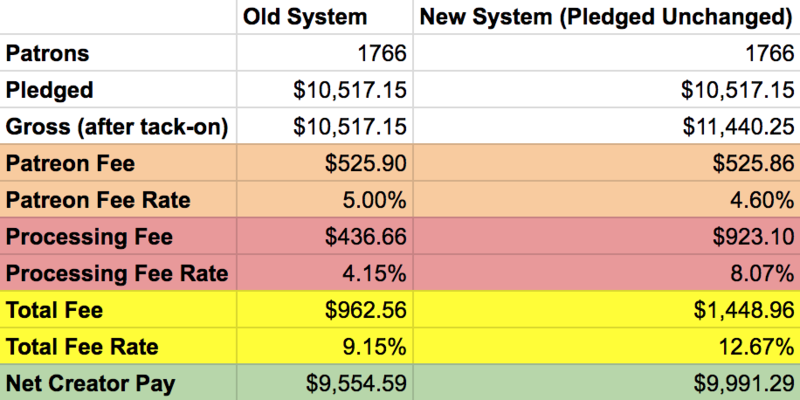 In the second column, I have applied the fee rules of the new system to the same underlying data. Note that I have deflated the pledged amount so that the gross charges to patrons after the new tacked-on service fee are equal. This sort of deflating is necessary to get a true apples-to-apple comparison. As you can see, the total transaction costs go from 9.15% to 13.10%, a hike of 3.95 percentage points. 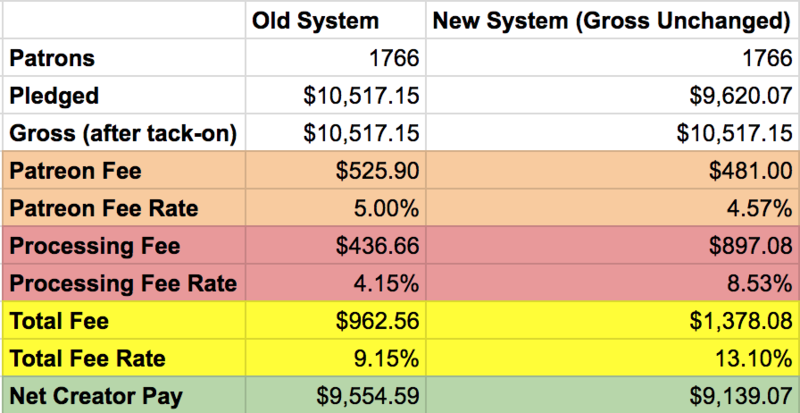 Holding gross charges equal, the new system would have reduced our net income by $415.52 last month. Patreon would prefer you think about it more like the following graphic. In this graphic, the pledged amount in column two is not deflated. So this represents what would happen if all our patrons just accepted the new tacked-on service fee without changing their pledges or quitting. In this case, the total fee rate still goes up from 9.15% to 12.67%, meaning a greater share of our patrons’ money is going to pay transaction costs than before. But the gross amount of charges have gone up so much that it overwhelms the fee hike. In this scenario, 3P winds up with $436.70 more last month. Judging from my account activity so far, it appears that most people are going to stay on at their current pledge and swallow the new service fee or quit altogether. The below graphic shows you how much quitting activity I experienced before and after the announced fee hike on December 7th. In addition to the deletion spike, I also count 18 exit survey responses that specifically mention the change in the fee structure as their reason for quitting. Another 10 quitters picked the pre-filled reason “I’m not happy with Patreon’s features or services,” but did not elaborate further. The total effect of Patreon’s changes is that the per-patron donation amount will go up each month while the number of patrons goes down. It’s not clear yet which of those two effects will be bigger and therefore whether we will wind up a net winner or net loser in absolute dollar terms. However, regardless of whether we wind up a net winner or net loser, it is clear that some patrons will be lost that I would rather not lose. In order to try to get those patrons back, I have created an account with ActBlue and will be contacting the patrons I have lost in the last few days to encourage them to recreate their recurring contribution using the ActBlue platform. ActBlue is a non-profit payment processing service for progressive candidates, causes, and organizations. It charges a flat 3.95% for every transaction and this is taken out of each contribution, not tacked on top of it. This is below the new 12-13% fee that Patreon is now charging and even well below the old 9.15% fee that Patreon used to charge. In the future, I plan to have a presence on every popular contribution platform so that people can choose which one they prefer to use to support People’s Policy Project. I will also create a “Support” vertical at the top of this website comparing those platforms to one another to help people make their decision about which one to use.